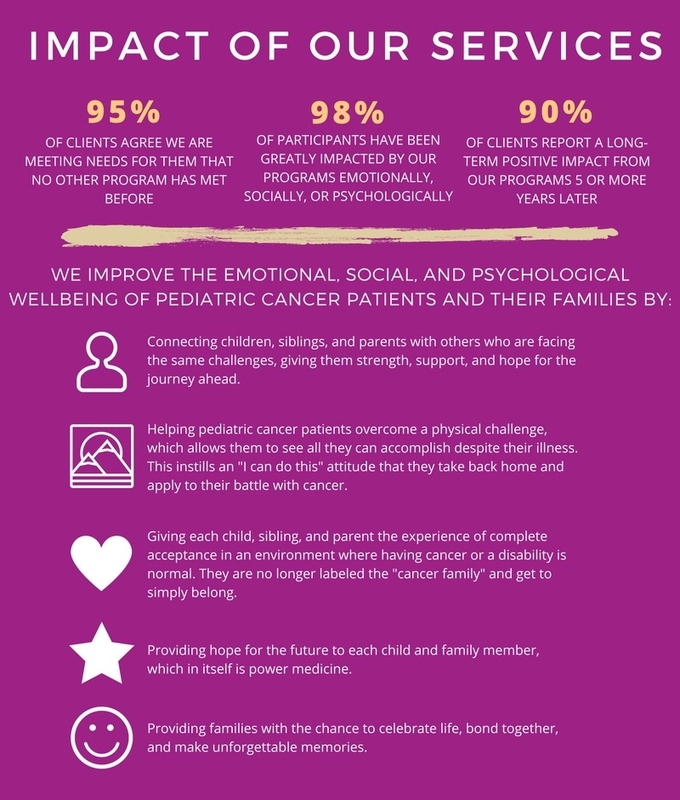 Our mission is to transform lives through year-round recreational and social programs for children and their families challenged with pediatric cancer or another life-threatening illness. We provide programs that help these children move past just trying to survive, to thriving and truly living again. We serve not only the child, but their entire immediate family, including siblings and parents. Annually, we provide 70+ outdoor, social, and recreational experiences, including adaptive skiing, hiking, snowmobiling, rafting, biking, cooking, swimming, climbing, sailing, and so much more. Family Services: We provide single day events and overnight programs for children battling a life-threatening illness and their entire immediate family. Child Services: We provide two, week-long adventure camps just for the child battling cancer or another life-threatening illness. Awareness and Educational Services: We educate the public about challenges faced by kids battling cancer though regular booths and presentations at community events. This includes presentations at local schools to help students understand the challenges some of their peers are facing and to promote acceptance. Young Adult Services: We provide a mentor program and a retreat for young adults ages 21+ who are survivors of pediatric cancer and struggling to transition to adulthood. Children living with pediatric cancer or another life-threatening illness ages 8-18 and their entire immediate family. A special focus is placed on children living with a physical or mental disability as a result of their treatment and/or disease. We have also just started serving young adults ages 18+ who had cancer as a child. The Shining Stars Foundation was founded in 2001 by Shining Stars CEO Kathy Gingery and a group of experienced volunteers who saw an unmet need in the Rocky Mountains for a program that would provide emotional support to children with cancer and other life-threatening illnesses. Originally focused on providing an adaptive ski experience through the Aspen Winter Games Program, the Foundation has now reached 928 children and their families! We love thinking of new and creative ways to improve the lives of the families we serve and are constantly evolving.